1. 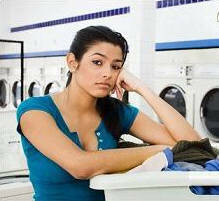 Do you work full-time in the business of selling Laundromats? 2. How long have you been in the Laundromat business? 3. Will you help me analyze anyone's listing for a fee? 4. Have ever operated a Laundromat? 5. Can you provide reference of successful customers? 6. Can you teach me about a utility analysis? 7. Can you inspect the equipment & facility? 8. Do you work from your home or an office? You should take enough time to learn the background of the business from reading and research. Use your own judgment and verification techniques to assist you in your final decision to purchase a Laundromat. Remember a Business Opportunity is not a business guarantee. Laundromats are purchased for a variety of reasons: a desire for business ownership, pride, self-employment opportunities, employment for a relative, estate planning, potential tax benefits, cash flow and equity gain are examples of these reasons. Businesses are sold because of illness, retirement, partnership disputes, relocation and a variety of other reasons that require a professional to find. You should carefully consider your resources and your reasons for buying a Laundromat before you begin your investment journey. The Laundromat business is an "all cash" enterprise making absolutely accurate verification of income on an existing Laundromat difficult. Income and expense projection on new stores should not be taken as a guarantee of actual performance, but as a reference for comparison. Some of the following might be helpful in your decision to purchase. You should have confidence in the broker who is going to assist you in your investment. You have a right to insist on having the person of your choice representing your interests. Some Laundromat brokers refuse to "co-operate" with other licensed brokers and firms because the majority of work is done by the experienced agent. The most often used verification of income is the statements of the seller. The listing agent receives from the Seller a statement of income and expenses and this information is used to prepare a setup or sales information sheet. A meeting with the Seller will give you an opportunity to access the Seller's character and might also provide valuable information on the operation of the Laundromat. Review the utility bills. Water bills are frequently used in a variety of formulas to give an indication of income. Make sure that you review at least one year's bills since Sellers have been known to leave the water running in the back room to pump up their income numbers for this method of income verification. Under normal conditions, this method can be considered accurate to within 5-15% of the actual income of the Laundromat. Be cautious if anyone suggests utility bills can verify income alone: expenses are suggestive and not a guarantee. The written records and bank statements of the Seller can assist in income verification. The income tax forms of the Seller are private, but if extended the opportunity, review them, since few people over report income on tax forms. 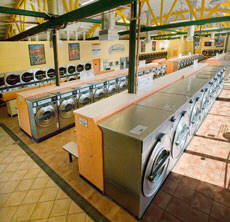 The main factor of determining value for Laundromats is the actual cash flow benefiting the owner. You may feel comfortable requesting a period of joint collection of the coin boxes. Since you cannot verify that the Seller did not "salt the mine," use this as a method of learning how to collect the proceeds from a Laundromat, not as a method of income verification. All brokers in the Laundromat industry know the "salt the mine" trick of Sellers, so avoid the suggestion from anyone who suggests this is a method of income verification. A professional salesperson will have a Site Survey form available so you can compare a potential purchase site against various locations known to be successful operations. different times during the day. Spend two full days at the site from opening to closing and count the actual income. Pick one day on a weekday and one on the weekend; combine the income together, divide by two and then multiply by thirty and you'll have an idea of actual monthly income. This should be used in combination with other income verification methods. Carefully read the entire lease agreement and all of the provisions. Consult an attorney if you do not understand your rights and obligations. The most overlooked provision relates to option periods being granted at "market rate." Spend a little time reading trade journals, magazine articles, repair manuals, and books on the Laundromat business that are available in most public libraries. National, state, or local organization of Laundromat owners have information available, can be biased because Laundromat distributors and brokers may be financial supporters of these organizations. They may also have a regional outlook or slant to their information. "What is the best way to find a deal on a Laundromat" is frequently asked by my customers. Many potential buyers believe they can save some money by negotiating their own deal and locating their own store. Unfortunately without the experience to access real value or find the pitfalls of a transaction, they end up being contacted by broker friends of the Laundromat owners or offered deals that appear good on the surface but in reality have glaring defects which I would spot. Use the following letter as a template; if a better way existed to get the first look I would tell you. Take the letter to your local copy shop and print it on bright colored paper. Carry them with you when you visit Laundromats and put a copy under the doors of every Laundromat within ten miles of your home or office. Let me have your contact information and I will work as your go-between . Wow! I learned so much on this website. I read the whole thing.